Some interesting bits have happened either today or over the weekend. What's your favorite newsy that's happened? The Elder Scrolls Online has seen it's forth major content update. In v1.4.3, quite a few new features are coming to players. Here's a quick rundown on what to expect. Haste improvements. Vengeance Leech set now only gives returns when you make a killing blow on another player. Tons of fixes to visuals, animations and sounds. Dragonknights received a huge buff. Added in ability altering enchantments, which can drop on weapons in the following areas: Dragonstar Arena, the Serpent Trial in difficult mode, and from the Alliance War Leaderboards. Veteran Rank has been increased to 14. Grouping improvements has begun, which includes items like shared group questing objectives, with some objectives removed, layered or condensed. For the full patch notes, check out the official post! 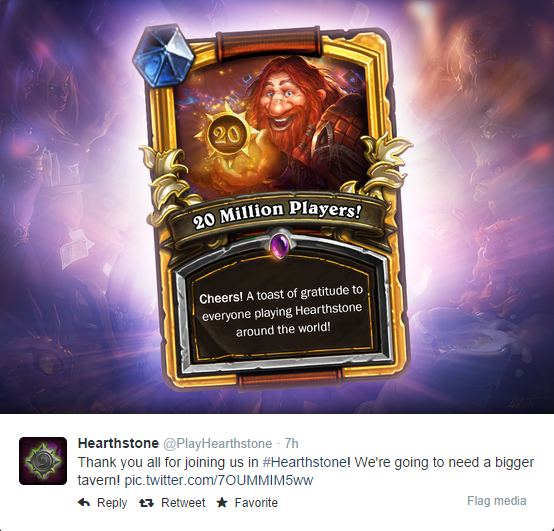 Today on Twitter, Hearthstone announced it has reached 20 million players – not bad considering it's been about six months! Neverwinter is ramping up for its next event, Siege of Neverwinter. It will begin at 10a PT on Thursday, September 18 and will run until 10a PT on Thursday, September 25. The day before (September 17) the event begins, Cryptic Producer Lindsay Haven will be joining in on a special Developer Livestream. During the events of Season of the Dragons, the dragons are closing in on the city of Neverwinter. It's time to take a stand and fight back against the invaders! More details for the event will be coming as it draws nearer. Tired of not being able to name your alt Capnsmellypants because you keep being told by the character creation server that the name is already taken? Worry no more! If Capnsmellypants is a long forgotten character that has not been logged in since November 13, 2008, now's your chance. Blizzard is releasing the names of sidelined characters that have not been logged in longer than Mankrik has been losing his wife. I hope this means that we can see less of the same generic, dumb name with not-so-clever alt character lettering in game now, as other silly names free up. I'll have to make sure to log in with my level 1 Tauren Paladin, Holycow. In order to keep up with server population demands, but not go too crazy, Trion has responded by opening up two new ArcheAge servers. North American players now have access to Inoch (Auction House Cluster 1), while European players have Aier (Auction House Cluster 3). These servers were likely already online by the time you woke up from your weekend binging coma, which made you sleep past your alarm clock. Try not to be late to work tomorrow. The fine folks over at /r/sto are holding a screenshot contest with the prize being Reddit Gold. The rules are pretty simple: one per person, use only screenshots that are yours, don't use ones you've already submitted, which have netted you over 50 link karma already, and while tools like Photoshop are allowed, please only use them within limited reason. All entries are as a comment to the thread asking for submissions that include a link to your image and the name of your ship. See the thread for full details and good luck! Lord of the Rings Online also received an update today. It continues the story of The Dead Marshes, where you can learn what became of our Hobbit heroes at the conclusion of Artamir’s story. This update is not as content heavy as what Elder Scrolls Online saw today, but players will see minor tweaks all over and a good deal of bug fixes. Today's been a busy day! What's your favorite news so far?